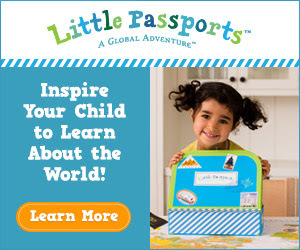 Little Passports is a learning adventure that takes your child through a new country (with the Little Passports World Edition) or two states (with the Little Passports USA Edition) every month. Little Passports subscribers journey along with characters Sam and Sofia as they explore the US and/or the world, complete with an assortment of travel accessories. Simply sign up for a monthly plan ($11.95/month) or a one year subscription ($10.95/month) and let the adventure begin!You can check out the entire list on the Little Passports Blog.